Hokkaido is a popular destination that is convenient to travel to from Tokyo. Find transportation methods to get to Hokkaido via airplane, Shinkansen, and car, and learn how much it costs and how long it takes to get to Japan's northernmost prefecture. Hokkaido is a major travel destination, boasting the largest land area of all the 47 prefectures in Japan. Visitors wanting to travel from Tokyo to Hokkaido are recommended to learn about how to get to the region they want to see, as cities and destinations in Hokkaido are located far apart. Read more to learn how to get to Hokkaido using the bullet train and airplanes, and find out the required time and cost transportation takes. Flying is a highly recommended way of travel to Hokkaido as it is quick, convenient, and inexpensive compared to the bullet train. There are 11 airports in Hokkaido. Nine can be directly reached from Haneda Airport. The number of Hokkaido-bound flights vary for each airport. For example, flights for Sapporo, New Chitose Airport depart the most frequently, leaving more than once per hour between 6:00 and 21:00 every day. Airplanes bound for Hakodate, Obihiro, and Asahikawa airports leave several times throughout the day. Flights to remote regions, like Wakkanai, Monbetsu, and Nakashibetsu depart just once daily. Flights from Haneda to Sapporo last roughly from 60 to 90 minutes. A normal one-way fare can range from around 7,000 yen to 12,000 yen depending on the dates. Furthermore, you can catch flights from Narita Airport on an LCC budget airline operator such as Jet Star or Vanilla Air, for around 5,000 yen. However, note the transportation costs from your lodging to Narita Airport, as well as the extra time it takes to get there. To get to New Chitose Aiport to other areas of Hokkaido, visitors can book flights going to Hakodate, Kushiro, Memanbetsu, Wakkanai, and Nakashibetsu airports. In addition, there is available transportation from the airport to the heart of Sapporo City: the airport bus, which costs 1,030 yen and takes roughly 50 to 90 minutes, and the JR Rapid Airport service - the fastest option - which costs 1,070 yen and takes 37 minutes. 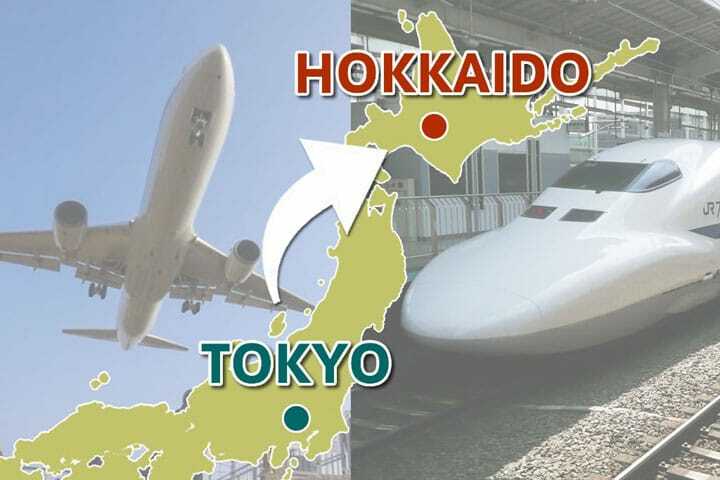 On March 26, 2016, the Hokkaido Shinkansen route connected Honshu (the main island of Japan) to Hokkaido, allowing direct access from Tokyo Station to Shin-Hakodate Hokuto Station. The bullet train journey takes approximately four hours and costs 23,210 yen. The flight from Haneda Airport to Hakodate Airport takes about 80 minutes. Riding the Shinkansen takes more time, but train service is usually not delayed or suspended during poor weather conditions. Therefore, riding the Shinkansen is a reliable mode of transportation. In addition to reliability, the leisurely pace of travel means allows riders to enjoy the scenery. Hokkaido’s wide roads are famous, and many visitors to Hokkaido want to experience driving on them. If you rent a car in Tokyo and drive north through Tohoku, then head up to Hokkaido, you can enjoy every sight along the way. However, you must keep in mind that the drive from Tokyo to Sapporo will take 17 hours without stops. Expressway tolls to Hokkaido will cost upwards of 20,000 yen, and transporting your rental car on the Tsugaru Kaikyo Ferry from Aomori Prefecture to Hakodate will cost at least 20,000 yen, plus the cost of the rental car as well as the gas. This is an expensive option, so if you plan to rent a car, you must anticipate the considerable time and money investment. When traveling from Tokyo from Hokkaido, the best form of transportation will vary depending on where you’re heading. Plan out your agenda and budget ahead of time so you can have a great Hokkaido trip. 7 Top Cherry Blossom Spots In Hokkaido - See Sakura And Nature! Up To 80% Off! ANA's Domestic Travel Tickets Are A Bargain!